An $11.50 string set up that stands up to Natural Gut/ Poly. This is the best hybrid I have found that actually had me cut out Wilson "Made in France" Natural Gut 1.30mm/ Head Hawk 1.25mm that wasn't ready to be cut out. I have 40+ reels of string in my stringing armory. With over 20 packs of Lux, Wilson and Babolat Natural Gut. Now have 4.5 players asking for this setup with 1.35mm HDX Tour Crosses to get a little more durability. Never expected this setup to be so darn soft and produce as much spin but it does. Love to see some of the TW playtesters put this combo in their favorite frames even if they don't video the results. Waiting with popcorn and coffee to see when and what @ByeByePoly will say. Tuesday was the day he was scheduled to trial FB HDX Tour. I am sure he will chime in tho I still think his itch has not gone MIA yet. I have strung cream in the crosses at around 56 lbs and I break it in one hitting session. It does feel great hitting with it, though. I have a 4.5 USTA rated male in his 40's that got 10 hours so perhaps you are an ATP pro. It worked well for the mid 40 year old former 5.0 SC player who probably should be a 5.0 again. Andy Gertz, an Open Level player and former TW playtester seemed to get much more than one hour. Considering 99.9999% of tennis players aren't Open Level pretty darn sure it works just fine for most 4.5 guys and below which is 99% of this forum. Well considering you are a 3.5 or possibly a 4.0 based on your other posts instead of the Open Level player like Andy Gertz, I am going with bad stringing. Perhaps you did something rather naive like using a sharp edge main. Sorry but I have seen the former 5.0 in person so his 10 hours is his Ai 98 makes more sense. Interesting. What was control like with this setup? Currently play 4.0, but play up in weekend tournaments. When the crosses broke, I cut them out and restrung just the crosses, keeping the main Klip nat gut intact. Crosses broke again within 2 hours the next day. I still have 4 sets left, and since I just started to string for myself, I'll use them up. I do enjoy playing with the cream. 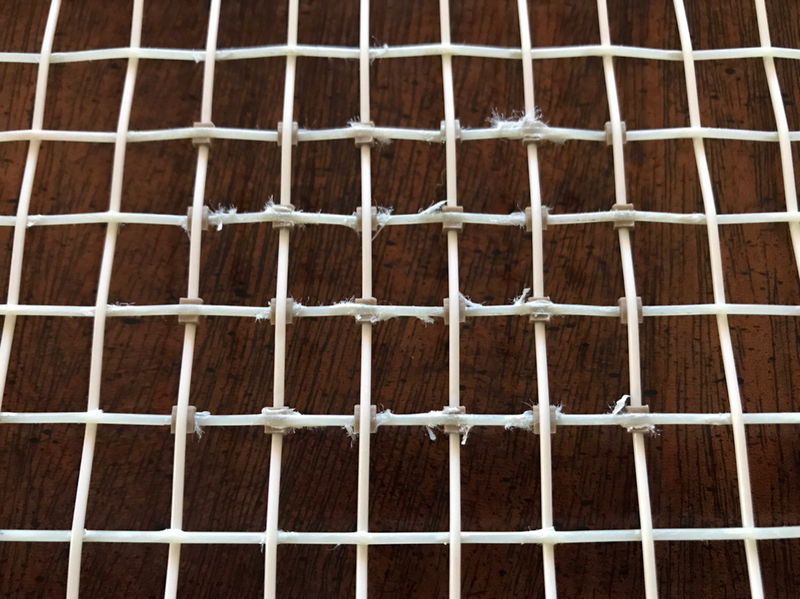 Why would you say bad stringing? I've strung about 20 rackets since I started stringing a few months ago. All rackets were mine, RF97A/PS85/PS90, tension ranging from 56-65, full bed poly to hybrid poly/ng. Excellent. Power, control and spin. I have played tennis for 30+ years and have probably never played better than I am playing now. Serves up the T or out wide either court better than I have hit. I have been a USTA 4.0 for quite awhile and play both singles and doubles. Well because I have strung a couple 1000 frames and because I have strung for 4.5 and 5.0 players and they get 10 hours out a string you break in 1 hitting session. 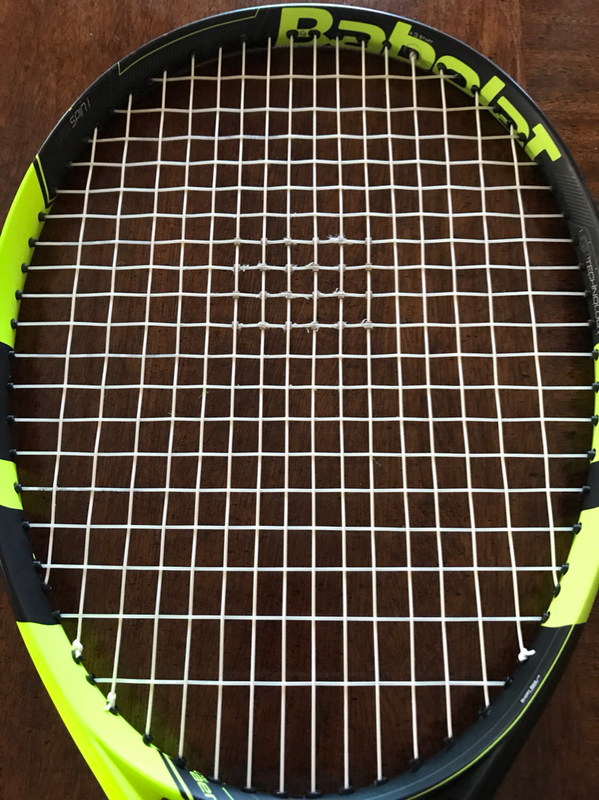 So yep, it is either terrible stringing or perhaps you hit much much harder than two former collegiate players now in their 40s. Been stringing for 8 years and when a former 5.0 named Will Shelley gets 10 hours out a string, and a 3.5 or 4.0 breaks the same string in an hour, something doesn't jive. I am not doubting you, but something is wrong. An open level player who worked for TW doesnt break the string in a full bed, but a 3.5 or 4.0 does. I have a 4.5 (Steve Cohen) who beat a USTA 5.0 in singles in 40+ Southern Sectionals in July 2017. Will Shelley a 4.5 beats Cohen another 4.5 pretty easily according to Cohen. So there we go names of the 4.5 players whose USTA records are available to anyone to look up. 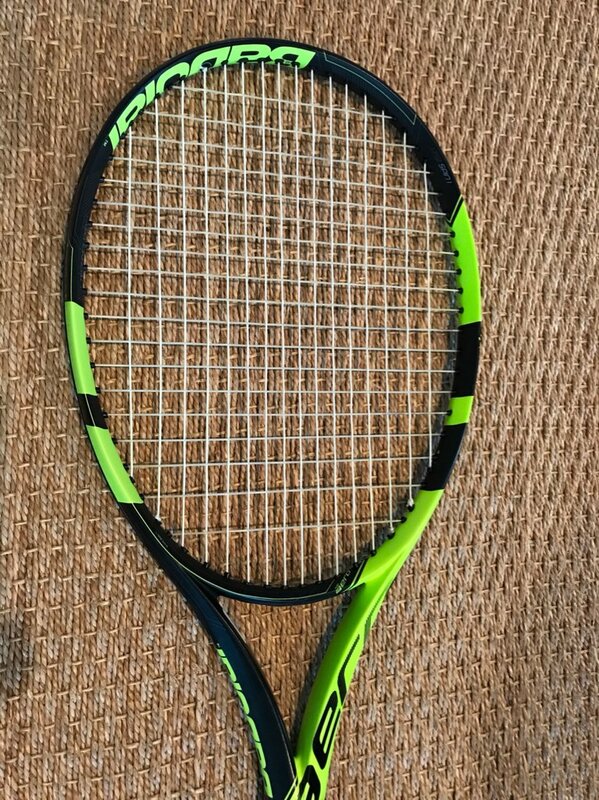 I can post a picture of Cohen's Babolat Pure Control Tour next time I string it, along with his snapped strings when he snaps them. That's cool. I'm nowhere near 1000 rackets. I was breaking strings a few times per week when playing in high school. Not having too much disposable income back then, I switched to Kevlar mains and whatever in the crosses. That solved that. Took a 15 year break from tennis and been playing almost daily since moving to Texas as the weather allows for outdoor play almost year round. What prompted me to string for myself was the week I broke 4 rackets in just as many hitting sessions and 2 doubles matches. I figured the amount of money I'd spend to have those 4 rackets restrung, I could just go out and put that money to buy a lot of string and a stringing machine. Been playing with nat gut for a few months for the first time and its been magical, especially since I can offset the cost of nat gut by stringing on my own. Prior to that I averaged about 4-5 hitting sessions before the strings broke. I currently string my crosses with Tourna Silver 16g, and I have yet to break those. I end up cutting out the gut because it is fraying substantially or isn't snapping back, after 25+ hrs of play. But as I mentioned, I love the cream string and will report back with the remaining sets in the crosses. Look up Steven Cohen and William Shelley, both in South Carolina. Cohen asked for the Cream / HDX Tour setup today. Look up Cohen's singles match in 40+ Sectionals July 2017 vs Alabama. Shelley is using 1.30mm Hyper G because he liked it better than Head Hawk 1.30mm / Isospeed Cream 1.28mm since he thinks the Hyper G produces more spin. Have you tried this combo in other tensions? So you have cream in the main? Have you tried it in mains & crosses with HDX? I haven't tried it at other tensions in my own frames. All frames strung on my Alpha Ghost constant pull machine. But will be putting in a 4.5 guys Pure Control Tour (16x20 pattern) at 48 M/ 50 X. I plan to upgrade him to 1.35mm HDX Tour as he will break the 1.30 mm HDX Tour most likely before the 1.28mm Cream. FYI : You can get 20 packs of 1.35mm HDX Tour for $200 (that's $10 a pack and $5 a cross). But TW doesn't sell 1.35mm HDX Tour. I have been using 1.40mm Prince Premiere Control in 4.5's Pure Drive Plus as a cross with Head Hawk 1.25mm mains for three years. I got the thought to try Cream and HDX Tour after reading the Velocity / Cream thread @Traffic started that @hemi392 seemed to discover and thinking of the Hawk / PPC setup for the 4.5 Pure Drive Plus. Multi / poly doesn't work well for the 4.5 guys I string for due to durability. But HDX Tour is 33% poly that feels like 100% multi and as a cross it is incredibly soft with Cream 1.28mm mains. My strings don't stick out of place in a Pure Aero with Cream / HDX Tour and honestly is it a a lucky discovery. 4.5 women seem pretty happy with the full multis they ask for. Most 4.5 guys break multi mains way to quickly. Gets $$$$ but one 4.5 guy uses Velocity full bed in a 16x20 Pure Control. Have you tried the Cream/Velocity, which has been much talked about in another thread? If so, how do they compare? It seems like you're stringing the crosses higher for HDX Tour. Is it because HDX Tour is so much softer than Cream? I played with a full bed of Cream full and HDX Tour as a full bed twice. A full bed a HDX Tour, or a full bed of Cream, and Cream / HDX Tour aren't the same. I playtested two full sets of 1.30mm HDX Tour for TW / Technifibre a few years back. Cream as a main makes HDX Tour better as the cross IMO. The combo of peanut butter and jelly on sandwich is better than a peanut butter sandwich or a jelly sandwich IMO. Same affect with these two strings. They make the other better IMO. I have it in a Prince Warrior Textreme 100. Just prefer the HDX Tour as my cross, perhaps due to the poly in HDX Tour. It isn't a bad setup but it didn't have me cut out "Made In France" Wilson Natural Gut either. The HDX Tour frame made me cut my "very hard to find" or perhaps "no longer available" Wilson Natural Gut. Hope that gives you a good idea of how well I like this setup. Anytime I string a hybrid with poly mains and multi crosses, I drop the poly tension and raise the multi tension by 2 lbs. Been doing this for years. The Head Hawk 1.25mm / Prince Premier Control 1.40mm Pure Drive Plus was always done at 55M/57X. That guy is also a 4.5 player. Lefty. String breaking and level are not the same thing. Back in high school there were kids on the same team as myself that snapped full poly in 2-3 hours and probably were not above 4.0-4.5. They certainly were not above the level of a playtester like Andy. I play with a guy from time to time who used to be ranked nationally in the men's open division, and is arguably still the best non-college player (he's in his 50's) in my area, and he only breaks one or two strings a month. Some people just happen to break strings faster than others regardless of their actual ability. Any idea why I've always been a string breaker? Any suggestions for my next string job that I should convey to a pro stringer? Last stringer I used in Dallas area used to string rackets for Wimbledon. Look him up, his new business is Rackets N Strings out of Plano TX. I used to see him weekly with 2 rackets each time. String breaking and level are not the same thing. Back in high school there were kinds on the same team as myself that snapped full poly in 2-3 hours and probably were not above 4.0-4.5. They certainly were not above the level of a playtester like Andy. I play with a guy from time to time who used to be ranked nationally in the men's open division, and is arguably still the best non-college player (he's in his 50's) player in my area, and he only breaks one or two strings a month. Some people just happen to break strings faster than others regardless of their actual ability. I agree 100%. 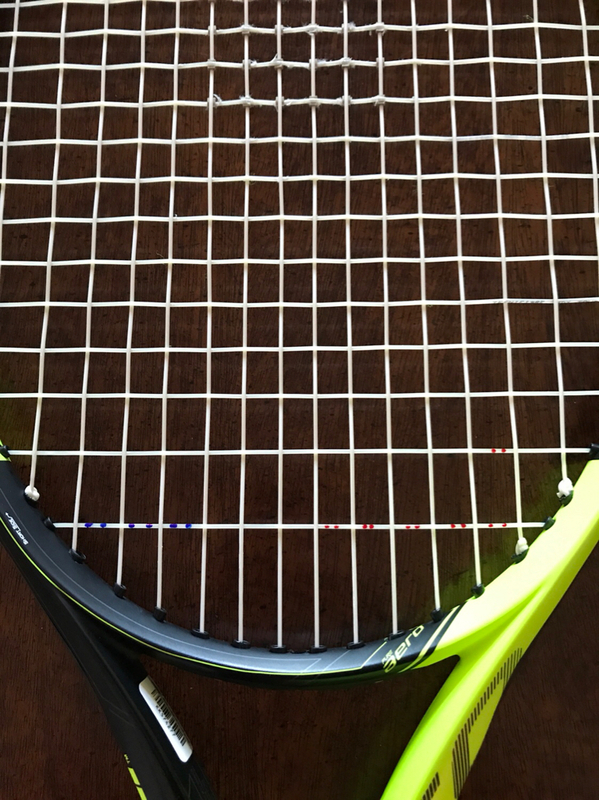 I play with a lot of top spin and speed, which on accelerates strings breaking. Been stringing for a while. When I see a person who has strung 20 frames, I see mistakes in stringing. I have taught people to string and my suspicion is doing something wrong. Were they snapping 1.30mm polys like 4G in 2-3 hours ? Or do you know the gauge of the polys. Because 1.15 mosquito bite ain't 1.40mm 4G. I can get many 4.0 guys to snap 1.15mm MB in 2-3 if I string it at 65 pounds. Thin soft polys at highs tension will break much faster than stiffer thicker polys strung 10-20 pounds lower. Most 3.5 / 4.0 guys don't out hit former collegiate players. Did you notice his tensions at 65 lbs on a cross ? I did. That is certainly a factor that will weaken a string faster than one strung at 50 lbs. The rf97a are strung 59 mains nat gut and 56 crosses. The ps85 is strung with some 16g kirkbaum, or something string like that, at 65. Haven't broken that in over 12 hours of play. Some rackets last me longer, but that's also dependant on string. Why did fb Cream come up short for you? I assume you read my Cream thread when I tried it in spring. After two hits, I had decided it would be my summer string. It matched my racquet and swing perfectly at 50lbs. What I mean my "match" is it was pretty much the best string I hit all summer for hitting my targets. Enough spin ... but mainly it just matched the power level for me perfectly. I would have stuck with it except at 6 hours, I felt a twinge in the elbow after a match. Really ticked me off ... I had settled on it in my mind. Tried Velocity ... and it just about as good a match, but totally forgiving on the arm. What did adding hdx as a cross gain you over fb Cream? More spin? Didn't you find fb Cream pretty good spin? IMO ... we have all zeroed in on really good strings with cream, velocity and tf hdx tour. A poly player trying to leave full poly could do a lot worse than trying these three strings. That's great, I'm sure you're incredibly knowledgeable about strings, and stringing. However, just because your experience suggests that string breaking at a certain rate is unrealistic, that does not suggest your experience is a definite rule. I've strung for 10 years now, probably 1500 frames or so, I can't really remember, but at one point in time I was doing anywhere between 15 and 25 frames a week for close to three months. I understand that a person who has only strung 20 or so frames is more likely to make a mistake, that's not really a surprise to anyone. However, according to this thread, this poster is stringing his crosses at 56, which is not a ridiculously high tension. Some people just happen to hit a ball with an aggressive swing that translates to a lot of string movement and broken strings. That doesn't mean they hit like Tommy Paul (who claimed to break full beds of Lux in ~45 minutes) nor does it mean they're even above a 4.5. But even a 4.0 with a full western grip, or lots of RHS is going to break strings quickly, regardless of whether or not their results or great. FWIW, in high school I broke full poly in an 18x20 in less than 10 hours. Now I use a gut/poly hybrid in an 18x20 and get roughly that much time out of my strings despite hitting a bigger ball. That full poly was at one point in time being strung by a USRSA MRT because I believed that the early breakage was my own fault as I had only been stringing for a short period of time. When I continued to break full poly in under 10 hours, I went back to stringing for myself. Oh, yes. I've made a fair share of stringing mistakes. I didn't start to break strings the moment I started to string my own rackets. Been breaking strings since 1995. I liked Full bed Cyclone Tour 1.30mm better than Full bed of Cream. Cyclone Tour and Cyclone both in 1.30 mm are two of my favorite full polys. Not knowledgeable, just dedicated to learn. And as quoted before, I was breaking strings way before I started to string for myself. When I broke 4 rackets in one week is when I decided to start stringing for myself, and ultimately progressed to nat gut. I thought I would never play with nat gut since it's so expensive. But when I get 25+ hours of it (before cutting it out), it justifies the price. I bought Babolat nat gut when it was 3 for 2,and I'll try that setup with cream. But I am very curious about the hdx/cream setup. Do you string the cream in mains or crosses? Sorry if this was written somewhere. Now that I have a stringing machine, I can experiment more with string setups. I use Cream mains, and HDX Crosses. If you break the crosses that quickly, you might consider perhaps Head Hawk 1.30mm. Head Head is an extremely slick smooth poly. I prefer the White Hawk over the gray. It seems slicker. Why did fb Cream come up short for you? Replied to you with my comments about Cyclone Tour and Cyclone. Cyclone Tour 1.30mm was my string of choice for almost all USTA matches for 4 years. I played with Gut / Hawk frames in non-Usta matches just because it was so soft. Cyclone Tour is a better fit for me full bed than Cream. Velocity and NRG2 are both more muted than X1 and HDX Tour. I have strung four reels and countless packs of NRG2 in the last 8 years. From 2010 to 2012 I was using X1 1.30mm as a cross, before switching to full poly in Jan 2013. I hate Babolat Excel as a cross. It is almost gummy. Awful for me. HDX Tour is just a better version of X1 and I can get it for $10 a pack in 1.35mm which makes it even more durable. That's with the 17g Cream as I couldn't find the 16g when it was available from tennis warehouse. There was a discount if I'd buy 5 sets, so that's what I did. I would be very reluctant to put Cream in the mains. There's no way they would survive a hitting session if the crosses can't. But, I'll give it a shot in a backup racket since my RF97A's currently have good strings in them. I'm playing this upcoming Fri/Sat/Sun, so I'll definitely report back. Thanks for the feedback on these strings. Every time I read about a hybrid string setup that plays well in comparison to gut/poly, I'm anxious to try it out. I was told that once I start stringing for myself that I would develop this thirst to try different setups, and I am definitely guilty of that. I thought I have found my holy grail of a string setup with gut/poly, but the curiosity in me wants to experiment further. Hoping, really hoping that the 16g Cream lasts me longer than the 17g. That makes a lot more sense. 1.23mm Cream is probably snapping 2 times faster than 1.28mm. That extra .05mm thickness makes a difference. Most polys can be used in 1.25mm for most 4.0 and most 4.5 guys I string for, but not all. Cyclone Tour 1.30 vs 1.25 are like two different strings completely. Cream is a softer poly than most polys. Cyclone Tour 1.25mm is awful and loses tension crazy quickly while 1.30mm Cyclone Tour works like a champ. TW has Cyclone Tour listed in their list of top polys strings under $10. Waited for the wear pattern to appear and then put in some string savers because I didn't want the frame I was using to break during a league match. Dont know how much the string savers help, but got through the matxh without snapping. Yes I have two backups but this setup is playing sweet like gut before it breaks. Played 7 sets in two days. ^ Now that is a nice wear pattern, right in the middle! I put in those string savers in yesterday afternoon after I didn't break the strings on Monday. Some people people prefer the APD. But the Pure Aero makes me a better player and this string setup just works for me. I think the Pure Aero likes me. How many hours until the HDX fuzzes up as a cross to cream? Is it about the same as other multi crosses you have tried with cream? Based on hdx reviews, I expect fb hdx to be non-fraying like fb velocity. I know you don't play fb multi, but do you think that is true. I only have 2 hours on fb hdx, so too early to tell. I used ss on the one fb gut I tried. Full gut mains don't appear to slide much anyway, so I chased the frays/notches. I would think it's the same one you have hdx fuzzed with cream ... mains already past early snapback phase, so why not ss to prolong a setup that is working. I noticed micro Cream fraying at 6 hours fb Cream. I say "micro" because it was like hairs compared to a gut fray. I will put some Cream 1.28mm mains / Velocity 1.30 mm in this same frame when the HDX Tour snaps. Bottom left part of the crosses I will log singles sets with a fat blue sharpie mark, bottom right I will log doubles sets with different color fat sharpie mark. When I break the Velocity frame, I will string it with 1.30mm HDX Tour and track the results with sharpies. We can compare apples to apples and I will try to keep the singles sets and doubles sets the same. Once the Velocity breaks, I will log the same number of sets in singles and doubles until the HDX breaks. I fully expect the HDX Tour to last longer than the Cream and I won't use string savers with either frame. But I am putting 1.35mm HDX Tour in my other frames since I got it for $10 a pack and bought 20 packs and will use those two frames for all league matches. Don't worry, I play at lesrt 3 pick up matches to every USTA league match. Playing a 4.5 guy in singles tonight. He is a teammate who was bumped in Dec. Split sets with him last month but that is as close as I get with him. His serve is better than most 4.5 guys and he gets a lot of free points. Makes tiebreaks tough. Was this post for me? If so, I apologize ... you lost me. My cream shredding the different multi question was simply out of curiosity since I have ruled cream out because my elbow seems to notice it. Go figure? I was also curious if hdx/cream would last longer than the point cream fuzzes your hdx in cream/hdx. I have hit my 1st 2 hours with fb hdx, and it's a winner. At this point, for me it is down to fb v or fb hdx, or a hybrid of the two together. If I hybrid, the hdx/v makes more sense. For one ... I like the tighter tension and more durable string in the mains. I know at this point the hdx will be the tighter tension for me, but am checking hdx durability (notching) with this 1st fb. This might be a long test, just not playing enough in winter. Yes. Post was for you. I will compare 1.30mm Velocity crosses in an apples to apples comparison versus HDX tour 1.30mm crosses with Cream mains in both. Two frames: same Cream Main in both frames. The only difference will be the crosses. One gets 1.30 Velocity. The other frame 1.30 HDX Tour. I will mark the bottom crosses with a sharpie after each set I play. One color for singles on one side of the stringed. Another color on the other side of the string bed for doubles. Basically keeljng track of when the crosses break, because they will break first. Let me post a sample picture for you. no reason for me to put multi in my mains as they just break mucn faster. I get much more life out of multi crosses than multi mains. If I use the same strings Velocity & Cream or Velocity & Head Hawk, the setup with poly mains / multi crosses last me longer. I went back and looked at my work calendar when I was out of town flying and my Fitbit app. Since it snowed in Charleston back on Jan 10th and our city was shutdown for 5 days and our clay courts were shutdown for nearly two weeks with two clay courts still closed today, it is easy to see which days I hit. I have 17 sets of doubles and 4 sets of singles on that frame with the string savers. At roughly 45 mins per set, that is 15.75 or right at 16 hours as a guess. This passes the logic test. I started using the Pure Aero Frame on 12/30. And can log the name and place of each player I played thanks to my Google calendar.